Autism is a general term used to describe a group of complex developmental brain disorders – autism spectrum disorders – caused by a combination of genes and environmental influences. A new case of autism is diagnosed every 15 minutes. Boys are five times more likely than girls to have autism. It is estimated that 1 percent of the world’s population is affected by autism, or 70 million people. There is no medical detection or cure for autism but early diagnosis and intervention can improve outcomes. 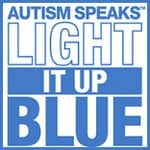 Check out their website and find out how you too can light it up blue! Not Getting Enough Sleep? Try These Helpful Tips!